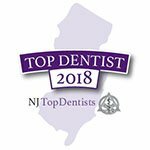 Replacing multiple missing teeth requires detailed collaboration between surgeon and restorative dentist. First, the proper diagnostic images are needed, and this is typically done with our in-house Cone Beam Scanner. Multiple missing teeth may include 2 or more teeth that are next to one another, or even the complete replacement of all upper or lower teeth. For those patients who currently wear dentures and are dissatisfied, there are multiple options that be can offered which range in complexity and cost. The first example shows a patient missing several teeth on the lower right side. 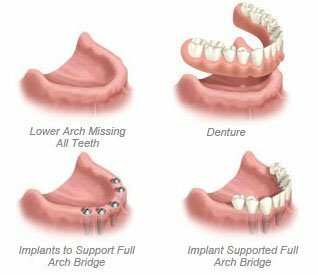 The first option to replace these missing teeth is a removable partial denture, which rests on the other teeth and needs to be removed at night. The second option is implants to support a permanent, non-removable replacement. The next scenario demonstrates a patient missing all their lower teeth. Before dental implants, the only option was a removable denture. Now there are many options available for this type of patient. 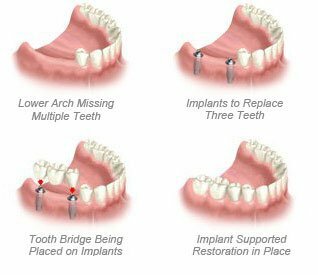 One option shown is implants placed to support a permanent, fixed restoration. 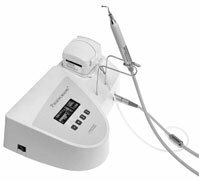 The technology of controlled three-dimensional ultrasonic microvibrations opens up a new age in bone surgery.